Hiring additional staff becomes inevitable for an organization when there is a lot of workload and workforce is limited. This workforce is basically the most precious asset of the company. Your business can become successful when you hire the right people at the right time. Hiring the staff is the job of the human resource department of the company. This department constantly keeps the check on the needs of the company when it comes to hiring a workforce. The number of people needed by an organization in order to carry out all the processes smoothly is determined by the human resource department. What is hiring additional staff proposal? Hiring staff proposal is a professional document which is used by various organizations when they want to hire additional staff and need to justify their extra hiring. Before you start writing the proposal, you should identify your needs. Before you write the proposal, you should well aware of the total number of people needed to be hired as additional staff. The job title the rank of new position should be known. It should be ensured that you don’t have a rough estimate rather the exact number you need to hire. Also, mention it in the proposal if you want to hire the staff temporarily or permanently. As a matter of fact, the proposal written with concise details is more likely to be understood easily and accepted. The proposal should contain headings, subheadings and simple language that can be read by everyone easily. Explain it in the proposal that you need more manpower for accomplishing the goals. Explain the total budget of the company. Some people also take interest in knowing how much money you allocate for hiring the additional staff. The proposal should include a cover page that makes it easier for the reader to understand everything about the proposal quickly. Make sure that you have written the purpose of writing the proposal clearly that makes it easier for the reader to understand why you are feeling the need to hire additional staff. When you are busy dealing with the problems your company is facing due to lack of workforce, writing the proposal becomes a hassle. In order to keep yourself from this hassle, you can use the readymade template. 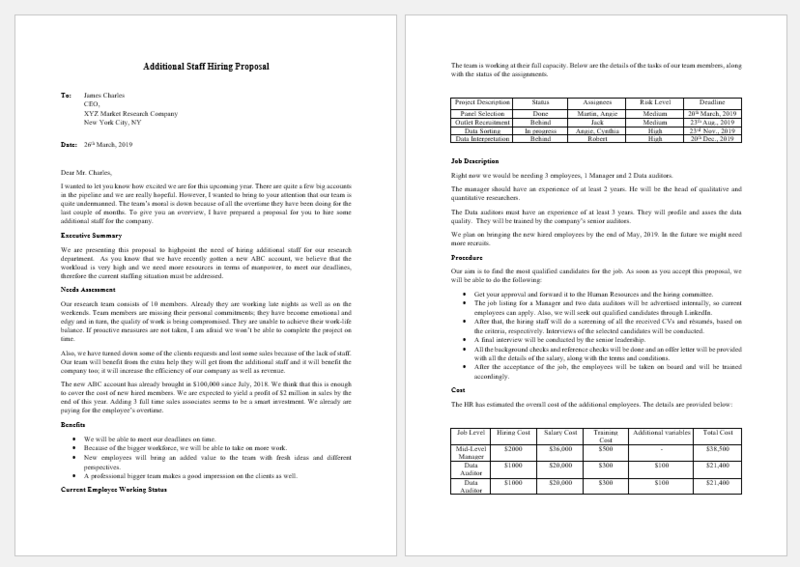 This template contains all the necessary elements that are included in the proposal written for hiring additional staff. If you want to add more elements to it or you think some of the details mentioned in the proposal are relevant to what you want to write, you can easily customize it to make it more suitable for your needs. I wanted to let you know how excited we are for this upcoming year. There are quite a few big accounts in the pipeline and we are really hopeful. However, I wanted to bring to your attention that our team is quite undermanned. The team’s morale is down because of all the overtime they have been doing for the last couple of months. To give you an overview, I have prepared a proposal for you to hire some additional staff for the company. We are presenting this proposal to highpoint the need for hiring additional staff for our research department. As you know that we have recently gotten a new ABC account, we believe that the workload is very high and we need more resources in terms of manpower, to meet our deadlines, therefore the current staffing situation must be addressed. Our research team consists of 10 members. Already they are working late nights as well as on the weekends. Team members are missing their personal commitments; they have become emotional and edgy and in turn, the quality of work is being compromised. They are unable to achieve their work-life balance. If proactive measures are not taken, I am afraid we won’t be able to complete the project on time. Also, we have turned down some of the client’s requests and lost some sales because of the lack of staff. Our team will benefit from the extra help they will get from the additional staff and it will benefit the company too; it will increase the efficiency of our company as well as revenue. The new ABC account has already brought in $100,000 since July 2018. We think that this is enough to cover the cost of newly hired members. We are expected to yield a profit of $2 million in sales by the end of this year. Adding 3 full-time sales associates seems to be a smart investment. We already are paying for the employee’s overtime. We will be able to meet our deadlines on time. Because of the bigger workforce, we will be able to take on more work. New employees will bring added value to the team with fresh ideas and different perspectives. A professional bigger team makes a good impression on the clients as well. The team is working at its full capacity. Below are the details of the tasks of our team members, along with the status of the assignments. Right now we would be needing 3 employees, 1 Manager, and 2 Data auditors. The manager should have experience of at least 2 years. He will be the head of qualitative and quantitative researchers. The Data auditors must have experience of at least 3 years. They will profile and asses the data quality. They will be trained by the company’s senior auditors. We plan on bringing the newly hired employees by the end of May 2019. In the future, we might need more recruits. Get your approval and forward it to the Human Resources and the hiring committee. The job listing for a Manager and two data auditors will be advertised internally, so current employees can apply. Also, we will seek out qualified candidates through LinkedIn. After that, the hiring staff will do a screening of all the received CVs and résumés, based on the criteria, respectively. Interviews of the selected candidates will be conducted. A final interview will be conducted by senior leadership. All the background checks and reference checks will be done and an offer letter will be provided with all the details of the salary, along with the terms and conditions. After the acceptance of the job, the employees will be taken on board and will be trained accordingly. We would like to thank you in advance for your thoughtful consideration of our request. We look forward to meeting you after the review of this proposal.